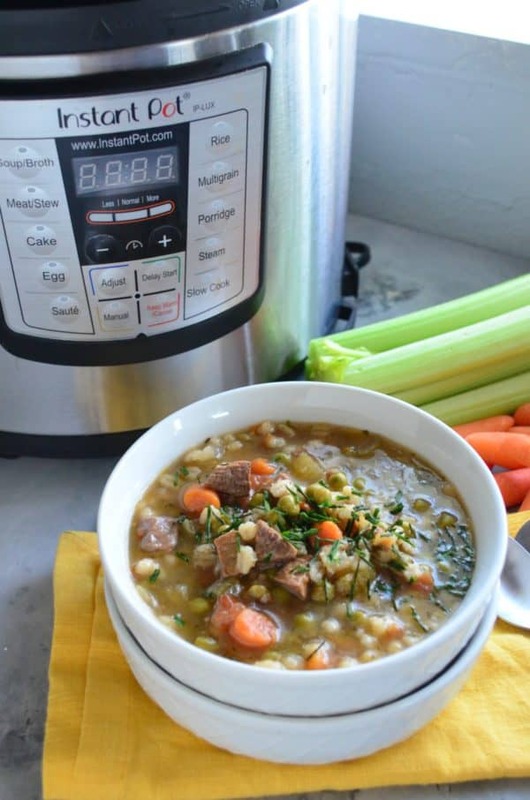 Let your Instant Pot make dinner tonight with my super simple recipe for Instant Pot Beef & Barley Soup. A hearty soup–perfect for a cold winters night! If you received an Instant Pot for Christmas your in luck. I have one of the most delicious soup recipes you’ll find on the internet! When I first received my Instant Pot last year I started by making a few soups. I feel like starting with soups is the best way to learn how your Instant Pot works. Then I started to get adventurous with other more complicated recipes. I mean let’s get real you throw a bunch of ingredients into the pot, set it and forget it. It doesn’t get much easier then that. 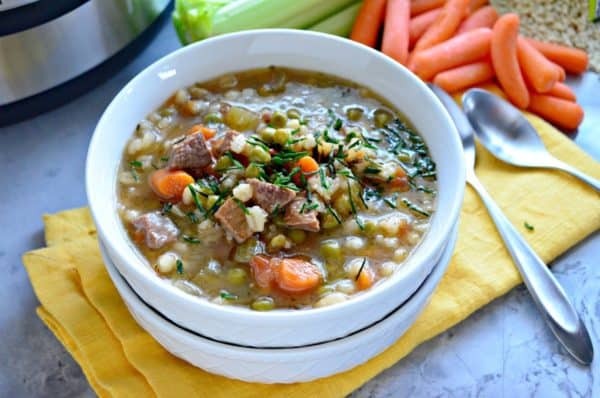 This Instant Pot Beef & Barley Soup was a huge hit in my home and I’m confident it will be in your home too. The day I made this soup my husband had been fishing all day and I had the kids for a 6th day in a row. When your a stay at home mom you look forward to the help on the weekends so your not running in every direction all day long. I knew I needed to make dinner but had ZERO energy to do so. I had some leftover roast beef and I knew that it was too tough to be reheated and consumed the same way we had enjoyed it for dinner a few nights prior. That’s when I had the idea to place it in the Instant Pot. I knew that the high pressure would break down and tenderize the meat transforming the leftovers into something new for us. Don’t worry–if you don’t have leftover roast beef on hand you can use stew beef instead you’ll just have an extra step to the soup. I wasn’t sure if my husband would be okay with soup for dinner that night. But he always surprises me and was happy to come home to soup simmering in my Instant Pot. He was exhausted and still feeling a little queasy from the rough seas he had experienced all day long. So soup was very much welcomed. We both grabbed a medium size bowl of soup and slurped it up immediately. Then he went back for a second and even third bowl. 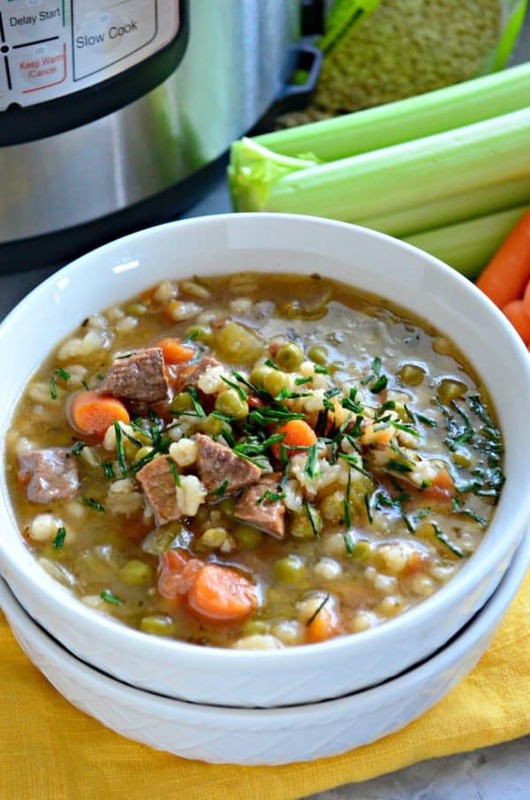 He declared this beef and barley soup one of my best soups to date. In fact–it’s what is for dinner tonight. My poor husband is currently battling a sinus infection and it’s freezing here in Florida. I know–everyone else is battling much colder temps. But us Floridians are not use to 30 and 40 degree weather. My heat is on FULL blast and soups are on the menu this week for dinner. 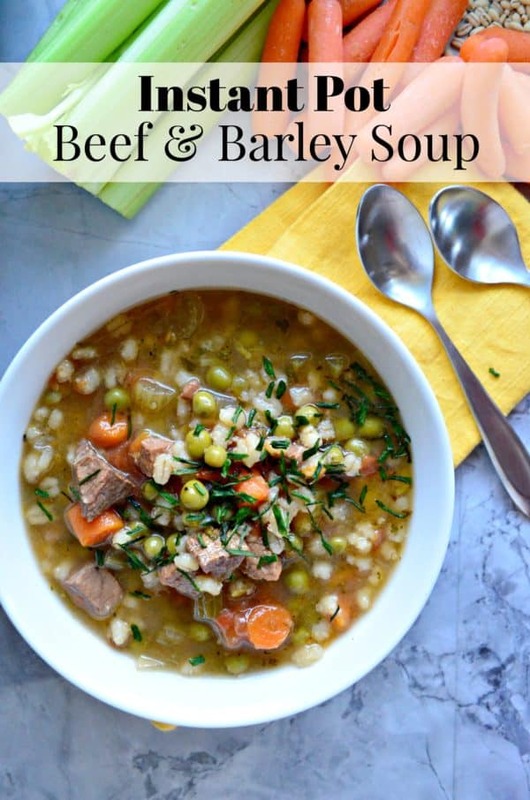 If you love beef and barley soup and want a hearty comforting soup that you can eat for lunch or even dinner you must try my recipe for Instant Pot Beef & Barley Soup! Turn the Instant Pot on to Saute setting. Melt reserved beef drippings, then add in the carrots, celery, onions, and garlic. Cook for 5 minutes. Then add in the diced roast beef and the broth. Turn the Instant Pot off then select "soup" setting. Set for 15 minutes. Once done cooking, carefully do a quick release pressure. Add in the plum tomatoes, barley, and frozen green peas (add the sliced mushrooms if you want them in the soup). Place the lid back on the Instant Pot and set for 1 minute on Manual Setting. Once done do a quick pressure release. Season with salt and pepper and ladle into bowls. Garnish with fresh chives and flat leaf parsley. *If you don't have leftover roast beef to use you can use oil and stew beef meat. Just brown the meat first then add in the vegetables to saute followed by broth. Then follow through step 2 (cook for 25 minutes on manual). Disclaimer: There are affiliate links in this post. That means if you click on this link and purchase from it I will make a small percentage of the sale at no additional cost to you. It helps run Katie’s Cucina and provide free recipes for you to use over and over again!